Max Muncy might have been the hero for the Dodgers in the marathon that was Game 3 of the World Series, but rookie pitcher Walker Buehler was the real star. The 24-year-old showed on Friday that he’s ready to be the next great Los Angeles postseason hero in his seven-inning shutout performance. For a team that had been tripping over themselves with their overthought personnel decisions this postseason, the Dodgers were pretty bold to start a rookie in this must-win. Still, Buehler was the only person Dave Roberts would put in this exact position, a sentiment the manager made clear in the post-game praise of his starter. It took a little time for Buehler to seize the moment, however. While he struck out two of the three batters he faced in the first inning—Mookie Betts and Xander Bogaerts—he needed 26 pitches to do so. But that was as bad as it got. The tide really started to turn for the pitcher in the third inning when he was able to pick off Jackie Bradley Jr. after allowing a lead-off single with a calmness that even All-Star aces fail to exhibit in games like these. Through his remaining six innings he struck out five more batters, didn’t surrender a single walk and never threw more than 16 pitches in a frame. Only Roger Clemens (Game 2, 2000) and Don Larsen (Game 5, 1956) have thrown seven or more scoreless innings while allowing two hits or fewer without any walks in a World Series game, per MLB.com’s Jesse Sanchez. It was a tough day to be a Red Sox batter, and boy did they know it. Buehler also kept an absurdly consistent velocity throughout his performance. His first pitch to Mookie Betts at the top of the first was clocked at 97 mph, and his final pitch of the night to strike out Hank Aaron Award winner J.D. Martinez hit 98—a feat that Sandy Koufax was quite impressed by. It would have been nice for Buehler to walk away from this with the win, but that honor had to be given to Alex Wood because closer Kenley Jansen gave up a game-tying homer to Bradley Jr., and the game was stretched to a grueling 18 innings. However foundation for this victory doesn’t get set without Buehler’s early performance. The 24-year-old has now repeatedly shown that he’s capable of performing in big games. He started in the Dodgers’s tiebreaker against the Rockies, and Game 7 of the NLCS. He can now add this historic World Series outing to his resume, but there’s still room for his legend to grow. 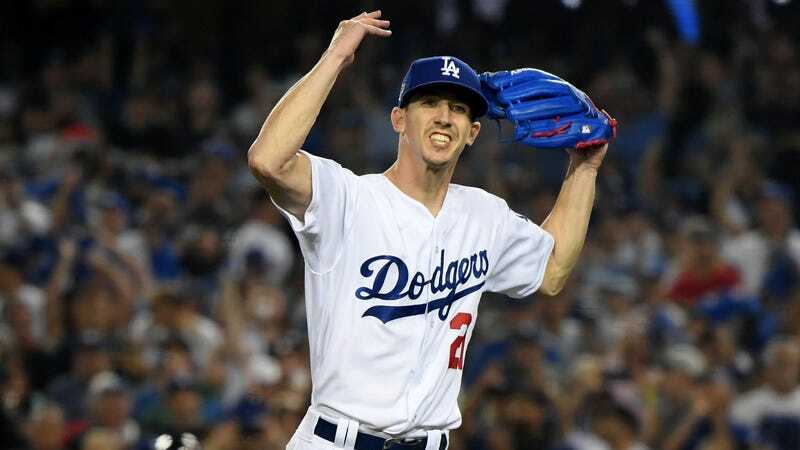 If the Dodgers can get over their offensive slumps, and defensive mistakes, and ride the momentum of this win to stretch this series out to a Game 7, Buehler will be back on the mound. The narrative of the rookie phenom turning into a clubhouse legend has almost written itself. Not bad for someone who started the year in Triple-A.